Anyone who stands next to me long enough knows that I really enjoy sketching. The other night I had a great opportunity to do just that: I spoke at a Service Design Thinks & Drinks event (big thanks to Damian Kernahan at Proto Partners for the invitation) on sketching techniques as part of service design thinking and practice. I skimmed through various ways that sketching helps others to communicate to us (and each other) in workshops, and us communicate to others, through deliverables like journey maps, storyboards and domain models. But the really fun part was demonstrating some simple techniques and shortcuts to sketch the sorts of things we often need to depict in service design: people and their expressions and moods, everyday objects, pathways and metaphors… even (gasp) drawing in 3D. 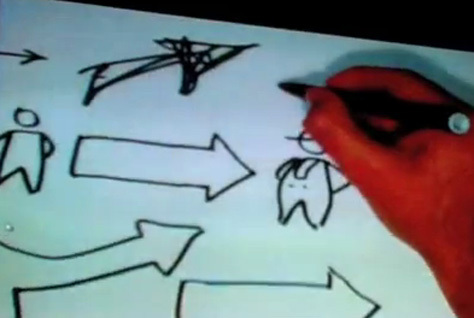 Service Design Thinks & Drinks Sydney : Ben Crothers from damian kernahan on Vimeo. The best part for me was being able to sketch in front of everyone, rather than just being another talking warm body in front of a slide deck. I’d rigged up an old webcam stuck to a small lamp, and it worked surprisingly well. The lamp illuminated the sketchbook where I was drawing, and the webcam fed the video through the laptop to the big screen behind me. I was also able to flick from the deck to the live capture, depending on what I was talking about. Here’s hoping to do it again soon!